1. This Product used in Pharma Machinery, Plastic Machinery, Printing Machinery. The range of air cooling blowers offered by us is designed for cooling occupants in large open spaces and portable air conditioning units. Our range is highly powerful, quiet and reliable that provides instant and controllable air movement as per the requirements. These air cooling blowers are appreciated among clients for its quality performance & maximum effect. 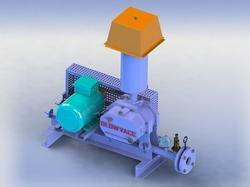 We are successfully engaged in providing a wide gamut of Barrel Cooling Blower.